It’s the weekend again!!! So much going on in Atlanta – lots of festivities happening for the BIG GAME for one…What else is happening? New attraction at the Children’s Museum, Pirate Day at Fernbank, Jugglers, Winter Markets, etc. Run Jump Fly @ Children’s Museum – Atlanta (all ages) $16+/personFri, Sat, Sun https://childrensmuseumatlanta.org/run-jump-fly-adventures-in-action/Jump into our newest visiting exhibit! Come explore activities such as kung fu, surfing, snowboarding, yoga and horizontal climbing! In each activity station, you get to build strength, coordination, balance and endurance. Test your ability to become the next "action star" in the Training Center! Groundhog Jugglers Festival @ Yaarab Shrine Center – Atlanta (all ages) FREE Saturday & Sunday http://atlantajugglers.org/festivals/upcoming-festivalYou’ll find jugglers, unicyclists, hoopers, kendama, live music and family fun for all ages at the Groundhog Day Jugglers Festival. Know how to juggle? Want to pick up a few new tricks? Just like to watch and maybe learn how to juggle? Pirate Day @ Fernbank – Atlanta (all ages) See Site for FEE Saturday https://www.fernbankmuseum.org/visit/events/2019/01/26-pirate-day/Ahoy, me hearties! Now be the time to weigh anchor and set sail on a swashbuckling adventure at Fernbank's Pirate Day! You'll be a landlubber no more when you navigate pirate-themed crafts and games, and meet members of the Atlanta Pirate and Wenches Guild.Pirate costumes encouraged! 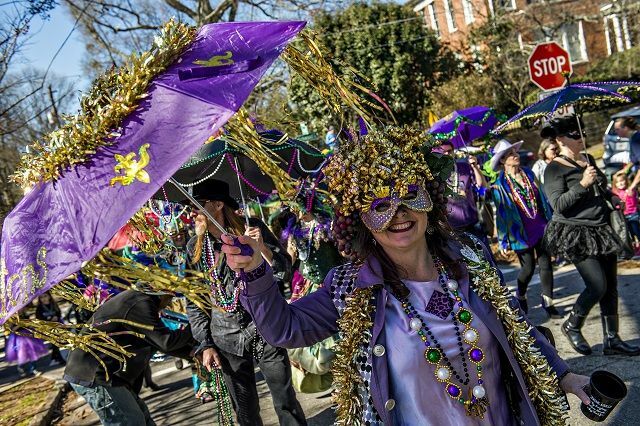 Lanta Gras Parade in Historic Kirkwood – Atlanta (all ages) FREE Saturday https://www.facebook.com/events/298603937445578/Family fun Mardi Gras parade with floats, music, dancing, and of course beads. New Year Open House Party @ Goldfish Swim School – Sandy Springs (all ages) FREE Saturdayhttps://www.facebook.com/events/2005172609519831/Come for open family swim, hot cocoa, cookies, raffles, and much more. FREE Crafts for Kids @ Lakeshore Learning – East Cobb (ages 3+) FREE Saturday https://www.lakeshorelearning.com/stores/locator/060Craft time for toddlers. Come and create in house at Lakeshore Learning East Cobb. Trains Trains Trains @ Southern Museum of Civil War and Locomotive History – Kennesaw (all ages) $7.50/person Saturday https://www.southernmuseum.orgThis years event will include new and expanded layouts that offer attendees the opportunity to interact with and operate a variety of trains. Enjoyment for visitors young and old alike.